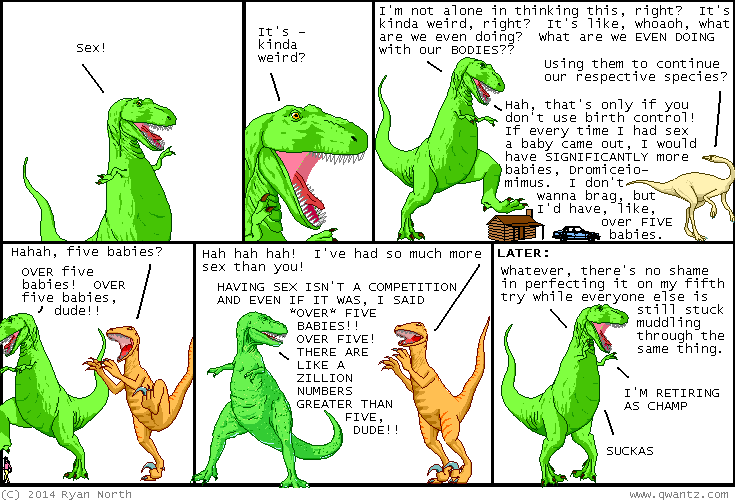 Dinosaur Comics - November 24th, 2014 - awesome fun times! –So you decide you're in the market for a house! November 24th, 2014: I did some RESEARCH by which I mean I TALKED ABOUT IT ON TWITTER and it turns out there are as many numbers greater than five as there are less than five! I thought it was the opposite since there were infinity+4 numbers less than five and only infinity greater than five, but I forgot how you could define a function that maps any number greater than 5 onto a number less than five and vice versa so the sets have equal size. All I remembered from set theory in university was that when it came to infinities the results were counterintuitive!